Bonus Thoughts: Pineapple Smash Crew & Titan Attacks! EDIT: Check the comments for some additional discussion of Pineapple Smash Crew; while I stand by most of what I say here, at the very least it seems I had some expectations of what the game would be like that weren’t entirely valid. I wanted to like Pineapple Smash Crew. I really, genuinely, desperately wanted to like it. 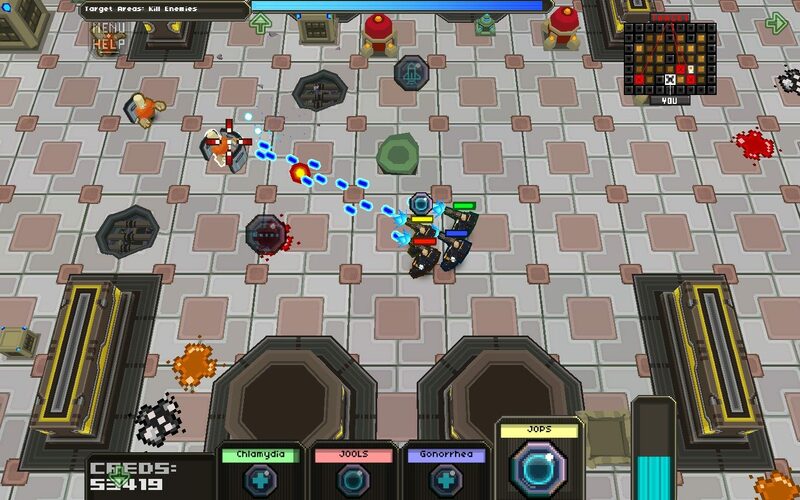 It should have heralded the bombastic return of the top-down arcade shooter. It should have featured a game world where literally everything exploded. It should have left me with a perpetual silly grin when playing it. Unfortunately only one of these things turned out to be true. I loved Cannon Fodder. My family owned an Atari ST – the Amiga’s inferior cousin, for all that it could do some amazing things with sound1 – and when the ST finally got a port of CF I… well, I badgered my brother to let me play, my parents deeming me too young to buy my own games at that point. I was predictably terrible at it; even splitting up my men seemed like impossibly advanced tactics to the seven year-old me, and so I mostly focused on the explosions and mayhem without too much concern for the dozens of my own soldiers who came back from each mission as corpses. As a result my version of Boot Hill quickly looked like this, and I didn’t get very far with the actual game part due to a sudden lack of new recruits to toss into the meat grinder. Still, Cannon Fodder left a very good impression which was only slightly dulled upon revisiting it a decade later. Truly they do not make them as they once did, and I was very excited to hear that Pineapple Smash Crew was “inspired” by Cannon Fodder. In retrospect this was incredibly stupid of me. “Inspired” is gamedev speak for “Has very little to do with but we want fans of the inspiring thing to buy our game anyway.” It’s been less blatantly abused in the case of Pineapple Smash Crew, but abused it has been since the game is frustratingly insubstantial. There’s almost nothing here. Your squad of four boxy grunts get dumped onto a boxy spaceship built out of a series of randomly generated boxy rooms and filled with boxy enemies. WSAD moves the squad, left mouse button fires in the direction of the mouse pointer, and right mouse button fires one of thirteen special weapons that each of the grunts can carry. Thirteen sounds like a lot, but in reality most of them either make something explode (grenade, land mine, missile) or fires a powerful shot in one direction (machine gun, laser). The visual effects are slightly different, but if you count the stuff that’s functionally identical you wind up with about four different types of offensive weapon plus utility items, and that’s how you end up prioritising them when deciding what to pick up. The boom-weapons are one of the few things the game gets right since the explosions in PSC are highly destructive and very satisfying; this reaction is somewhat muted when you try to throw a grenade through a door only for the door to suddenly shut and the grenade bounces back in your face. Doors are opened by shooting them but they automatically shut once you’re a certain distance away, which happens to be exactly the same as the minimum safe distance from the boom you’re trying to make (the explosions take up most of the screen). So you lob the grenade, and you back off to avoid being caught in the explosion, and then the door closes in your face and the squad gets blown up. This sort of thing is rather emblematic of the hundred different niggles that do not exactly make for a harmonious gameplay experience. Still, it might not have been a total loss; hurtling around the levels making everything blow up is reasonably fun. For five minutes. Then you start wondering what else there is to do in Pineapple Smash Crew, and the answer is: nothing. This is it. This is the entire game. The randomly generated levels do it no favours whatsoever since the parameters used to do so result in every level being basically the same: either some corridors filled with crates and monsters or a slightly wider-open space filled with crates and monsters. The monsters themselves are completely braindead, mindlessly walking towards and shooting at your squad even if they’re separated by, e.g., two foot-thick bulkheads and a laser field. The “missions”, if you can call them that, consist of either shooting crates, shooting baddies or sliding explosive hockey pucks onto target areas. And the end boss of every level is the same. The end boss of the game is the same, just with a different coat of paint and roughly a hundred times the hitpoints. Pineapple Smash Crew is possibly the most repetitive game I’ve ever paid money for, and it quickly becomes tedious after the second level. Unfortunately there are ten more left to go after that before you “complete” the game and get booted back to the main menu. This is going to be brief, because Titan Attacks! is really easy to describe. It’s Space Invaders. Or to be more precise, Space Invaders as seen in that one episode of Futurama, with the tank going along the ground and everything. 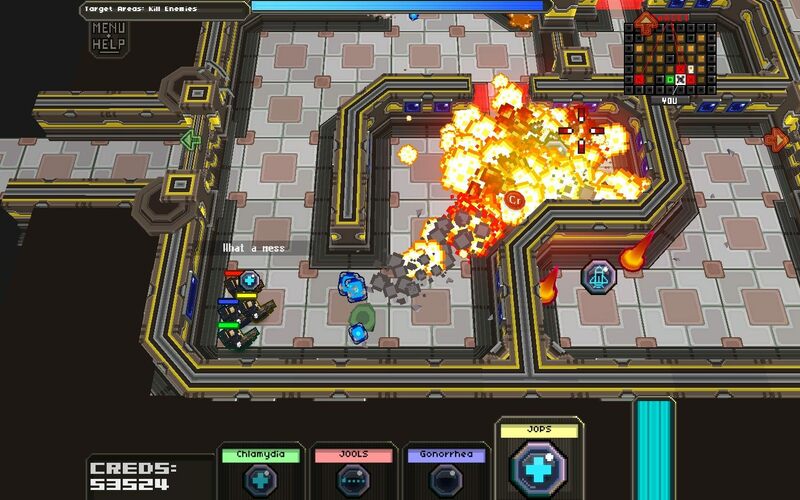 It’s made by Puppygames, developers of Revenge of the Titans — an indie tower defence game that I loved every second of — and while Titan Attacks! is far more limited than that I still think it’s a worthy game because it knows exactly what it’s trying to do and doesn’t fall on its face by trying to overstep the bounds of the concept. Instead it concentrates on squeezing every last drop of enjoyment out of the Space Invaders concept, and there’s actually a surprising amount to be found in it. The addition of upgrades for the tank which can be purchased in between rounds adds the tiniest dash of decision-making to the mix, while there’s a whole bunch of neat little touches like the occasional alien who parachutes out of his doomed spacecraft to be captured by you for bonus cash. Titan Attacks! 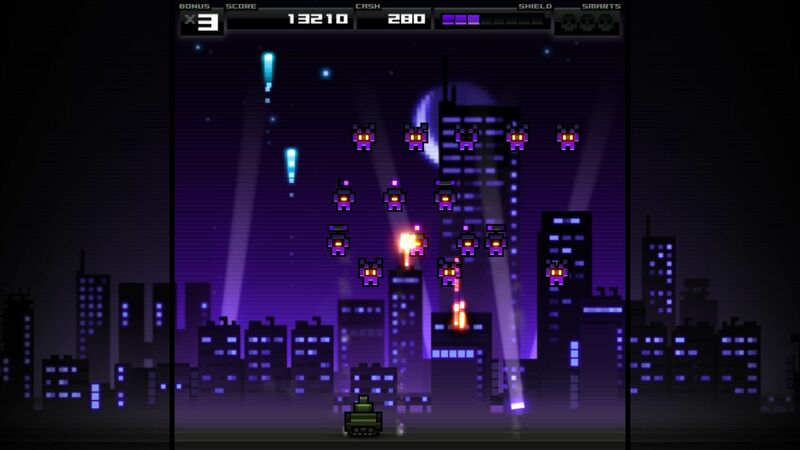 isn’t particularly deep or different so if you hate Space Invaders you’re unlikely to enjoy it that much, but it is very well-made for what it is. Really the only criticism I can make of it is that it’s not set up to accommodate high-scoring runs; there’s a hundred waves of bad guys and the game loops back around to the start once you’ve run through them all, and so building up a big score is more a question of being willing to grind through the game for an hour or two than it is any real skill on the part of the player. Titan Attacks! 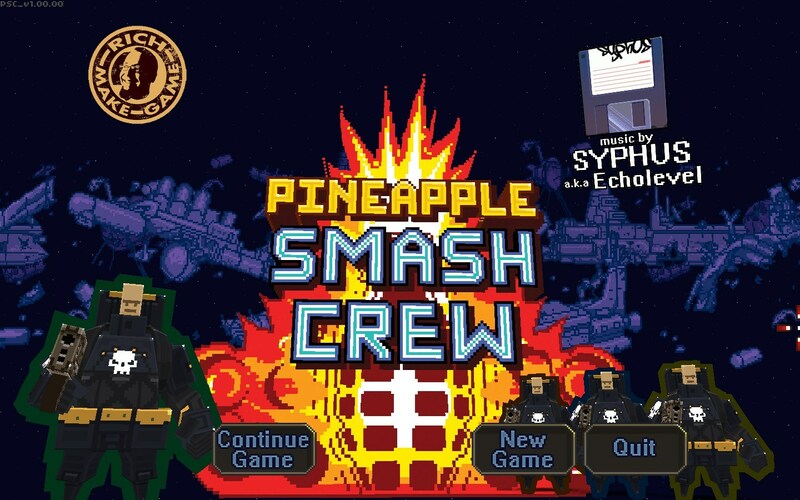 is unlikely to entertain you for more than a few hours, but it’ll last at least as long as Pineapple Smash Crew while being far more fun and – best of all – less than half the money, allowing you to spend the remaining four quid on Revenge of the Titans next time there’s a Steam sale. Everybody wins. 1. This is where my adult predilection for chiptunes comes from. 2. This is fantastic by the way, but there’s only a few tracks, each track is only a couple of minutes long and levels go on for anywhere up to twenty minutes so you get to hear the same tunes looped over and over again. No music can survive that. Tagged Cannon Fodder, Pineapple Smash Crew, Puppydog games, thoughts, Titan Attacks! Why are your four guys called Chlamydia, JOOLS, Gonorrhoea and JOPS? Scabies and Crabs bought it on the first mission, and it only lets you name your first four guys. Also I am literally a twelve year-old. Ouch, well thanks at least for taking the time to review PSC. If someone told you it played like Cannon Fodder though, it wasn’t me- I list about 8 separate game influences on my site, all genuine, none of which the game is intended to play the same as. Heh, apologies if my opinion was a little *too* scathing. I don’t seem to have much of a neutral setting when it comes to games; I either enjoy something or it’s the worst thing ever, and PSC seems to have fallen into the latter category, hence the harsh words. They may have been overly harsh since I do enjoy my hyperbole. However, I do stand by the general thrust of the review (indeed I believe John Walker over on RPS has said much the same sort of thing) which is that Pineapple Smash Crew is a fairly decent gameplay mechanic looking for a decent game. It’s not enough to put in some shooting and explosions and randomly generated levels and then call it a day; what the game badly needs is a sense of *structure* beyond the vestigal — not to mention badly repetitive — mothership coordinate terminals. I’m not a game designer so my opinion may or may not be valid here, but I really think you hamstrung yourself with the randomly generated levels. PSC is a classic example of why that can be a bad idea; far from making every level different it makes every level feel the same, since they’re all being constructed to the same set of general principles. You don’t need to throw those out the window but I do think the game needs a core set of purpose-built levels to inject some guaranteed variety and challenge into the game — levels that go beyond one of the three generic missions that are currently present, where you’re completing the same task three times and then teleporting out. Perhaps it would be a good idea to base the gathering of the mothership coordinates mainly around these levels, and reserve the random ones as an optional, supplementary experience. And then the mothership itself needs to be more of an event rather than just another level with a particularly tough boss — something worthy of rounding off the game instead of the arbitrary stop it is at present. More feedback when a soldier dies. Cannon Fodder had Boot Hill and the scrolling list of dead when you finished a mission. PSC has.. what, exactly? This is actually two problems with the game rolled into one: first, prior to the final boss battle I lost two soldiers in the entirety of my campaign and that was on the first mission when I had no idea what I was doing (i.e. I don’t think the game, as it stands, is challenging enough), and second that there’s no *connection* to my soldiers. I don’t think they even get named on the victory screen; it’s just a series of anonymous dashmarks representing the dead and very much forgotten. It’s a little unwise to directly evoke what Cannon Fodder did in this regard with the use of the names Jools and Jops when PSC’s treatment of it is so superficial. Enemy variety and AI. I think most differences in enemy types consist of what happens when you shoot them; all but two enemy types walk towards you slowly while firing their weapon (if they’ve got one), and the only reason the turrets don’t do this is because they physically cannot move. It’s rather telling that the one enemy that made me sit up and pay some attention was the one enemy that did not do this: the purple spider thing that stops for a second and then charges you. More enemies like that would have gone a long way towards keeping me on my toes. In spite of what I said in the review the weapons are largely okay and don’t need fixing to pander to my particular preferences. However, I feel the way in which they are gradually unlocked is a little absurd and unnecessary. What is the rationale behind arbitrarily spoon-feeding them to the player? I don’t think this adds anything to the game, and in fact while I was chatting to a friend who also bought the game it turned out that I’d apparently missed out on one of the better weapons entirely (the teleport beacon). If you are planning to continue development on the game and add in more features then I wish you the very best of luck. For what it’s worth I think PSC isn’t beyond saving and that it does contain the seed of a very good game. It’s just going to take an awful lot of work to get there, is all. PS: I hear what you say about the Cannon Fodder thing and it was unfair to attribute that directly to you, but that was the impression I got from many news sites that led me to purchase the game. Thanks for the detailed reply I think I was just a bit taken aback by the idea I was employing some cynical ploy, when the truth is more like I might just have been a bit too ambitious with my first project. It’s true there are Cannon Fodder references, but also a bit deeper are references like ‘FastSphere’ (speedball) and ‘The Order Engine’.. I wanted to reference things dear to my own childhood gaming experiences which led me to make the game. I hear your point about evoking expectations so perhaps I can chalk that up to a ‘noob mistake’. I don’t feel like I’ve completely failed- along with receptions like this and the mentioned RPS review there have been kind tweets and emails from people who didn’t look for anything deeper, and actually enjoyed the simple approach. I do plan to gather all the feedback and focus on what changes will give the biggest boost to the experience, and it makes such a helpful difference when criticism is followed with ‘and here’s what changes would improve things’. Thanks again for taking the time to explain the problem areas in more detail.